Lot Detail - Dormir dans Les Pierres. (Surrealism) [Tanguy, Yves] Peret, Benjamin. Dormir dans Les Pierres. 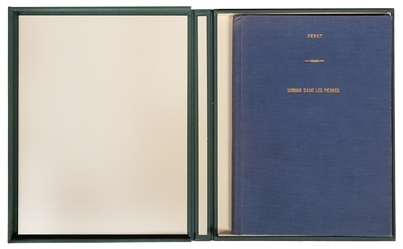 Paris: Editions Surrealistes, 1927. Number 163 of 205 copies, on verge Marquis, of Tanguy’s first book illustrations. Original wraps bound in blue cloth. Signed by Peret and Taguy on the colophon. Fifteen drawings by Tanguy, including the title and three full pages, the wrappers, title page, and three drawings hand-colored in gouache. 8vo. Light spotting to a few leaves in upper right corner, else fine. Green cloth clamshell.